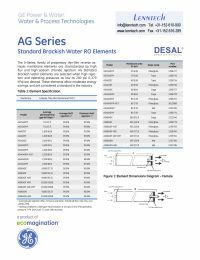 The GE Osmonics Desal AG-Series is a family of Thin-Film RO membrane elements that offer high flux and excellent sodium chloride rejection. They are an excellent choice for applications where high rejection and low operating pressures are desired. These elements allow moderate energy savings since good rejection is achieved at operating pressures as low as 200 psig, and are considered a standard in the industry.